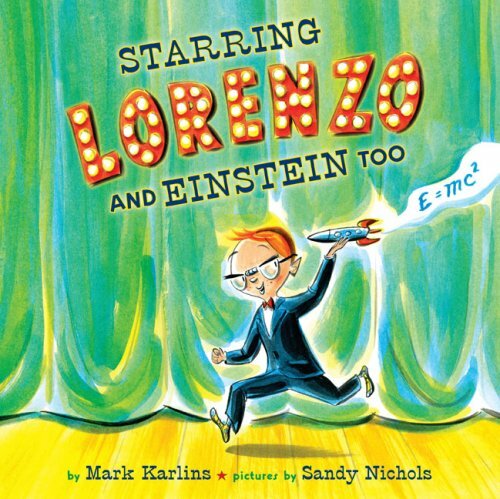 Luisa: Your children’s books have interesting characters that strive to find ways to fulfill their potential—as was the case for Lorenzo in “Starring Lorenzo, and Einstein, Too.” Are any of your characters based on actual events or real people? How did you come up with the premise for the books? Mark: Both actual events and real people are only starting points for me. None of my characters are based on actual people, but they do all possess common human traits made specific. Making those common traits specific, of course, is central to the creation of believable and memorable characters. When I think about my various books, I do notice that certain types of characters and actions do reappear. I suspect that this partially comes from the fact that elements of who I am appear in my characters. How couldn’t they? Various themes in my actual life appear. I don’t decide to do this. They appear naturally and unintentionally. Luisa: You’re originally from NY. How easy is it and how often do you incorporate the city in your work? Mark: With the exception of my first book, all of my books take place in NY. More often than not, they take place in Brooklyn, just across the river from the more glamorous Manhattan. To see the Brooklyn or Manhattan Bridge stretching across the water fills one with longing. Yet Brooklyn, for me, at the same time has a grittier reality to it. I easily return to NY in my stories. I no longer live there, but having been raised there, it is the place I most naturally turn when working on a picture book. Luisa: You’ve also written two books of poetry for adults. Can you give us some insight into your experience as a poet? Has poetry influenced your children’s books? Mark: The audience is different, but, in some ways, the aims are similar. Both poetry and picture books call for an ear for language, an awareness of pacing, and an ability to work within a tight structure. Both also, when they are working at their best, periodically call for imaginative leaps. I hadn’t thought about this before, but when John Donne (was it?) defined 17th century Metaphysical poetry as the yoking together of opposites, he could also have been defining the way I go about writing my picture books: a boy from Brooklyn “yoked” together with Albert Einstein in Starring Lorenzo And Einstein Too, for example. I suppose I am also influenced by, or share a similar sensibility with, some of the Magic Realists—Magic Realism for children. And Chagall – I have never intentionally been influenced by him, but my work has been compared to his, and I suppose there is some similarity. I have meandered a bit from your question. Let me try to return. The parallel between writing poetry and picture books can only be taken so far. For example, my children’s books, unlike my poetry, are character-based and humorous. Language is simpler in picture books than it is in most poetry, certainly the poetry that I wrote. I haven’t actually, truth be told, written any poetry for years. But that is a whole other story in itself. Luisa: In preparing for this interview, I did a little background research and found that you’ve got two grown children (a teacher/musician and a painter!). Do you have any advice on how parents can help their kids fulfill their potential? Mark: There has been nothing more important in my life than my children. I always encouraged them in their artistic pursuits and it was always clear to them that the creation of art is a primary human activity, that in many ways art is what defines us as human. (I don’t think I phrased it quite that way, but they understood that from early on.) My wife, a dancer and a choreographer (and now someone who is attempting that most daunting of pursuits, the writing of a novel), also made them aware of the importance of art. We did this through various actions. They could, for example, see that we were serious working artists. Education has also always been important in our household. Both Mary Lee and I teach. My son, Jake, is teaching. All four of us are always reading, listening to music, etc. Such is the atmosphere in which we dwell. More generally, I always listened to what my children had to say, and still do. First of all, I am interested in what they have to say, but to indicate an interest in their thoughts also gives them a stronger sense of identity: they are clearly visible. Connected to that, I tried to be as undistracted when around them as possible (which is not to say that I never busied myself with some other task when around them). I tried/try to be as present as possible and to indicate to them, just as I would do with anyone else, that they are central to my concerns. Luisa: Can you give us any hints as to what you’re working on next? Mark: I’m back in New York again, imaginatively. I’m just at the beginning stages, so we’ll have to see. Luisa: How difficult has it been for you to come up with your topics? With regard to your poems, how different is that process from writing for children? Mark: I try to write five days a week. I make writing a practice, a discipline. If I am in a continual act of writing, ideas appear vs. waiting for inspiration prior to writing, which is a rather romantic and impractical notion of creation. When I am not writing, if I can keep my mind open, other influences will come in. I might, for example, read something which seemingly has absolutely nothing to do with the story I am working on and then, quickly, make a connection between the story and the seemingly unrelated thing. I might be working on a story about a family of theater performers and then read something about Albert Einstein and connect the two, which is not to say that is actually how Einstein and Lorenzo got together in Starring Lorenzo, because I’m not completely sure how that happened. If I allow myself to connect unlike things or events, without too much thinking about the connection, I might have something of interest. Connecting unlike things equals invention. Mark: I read a lot. I was quiet. I was interested in a wide variety of things and tended to become deeply involved in them. Not much has changed. Mark: What a great question. Since I am being interviewed as a children’s author, the people who first come to mind are Sendak, Steig, P.L. Travers. But if I think more about this, I would go outside of children’s literature. Shakespeare, of course, comes easily to mind. Shakespeare as he is in the middle of writing King Lear or Hamlet would be the time to talk with him. Or Dante. Yes, I would like that very much. We would spend a long weekend together. In an English tavern, I could meet Chaucer and hear some of his stories. But if I had to choose just one author, I would take things farther back and go with Homer. We would sit by the coast at night, a fire burning, the stars above us, and I, along with a community of others, would listen to him reciting passages from the Odyssey. I would ask him how far back this oral tale went, just how ancient it was and what it said about the people who created it. I would ask him about those two magnetic poles, the desire to explore and take to the sea and distant lands and the desire to journey home. How do these two poles create identity? Which pole has the stronger pull? What is a hero? Since it is possible that he was not only an oral storyteller but also wrote down his tale, I would ask him about such things as what were the current forms of writing–clay tablets, papyrus, etc.—and how that material and the act of writing helped to reform the oral material. We would walk along the rocky shore and talk about Penelope’s loom. Links of interest: “Starring Lorenzo, and Einstein, Too” review and Mark Karlins website.